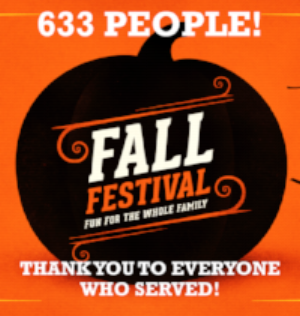 ...to everyone who made this year’s Fall Festival amazing! We had 633 people! That is about 200 more than we usually have. Without excellent volunteers spending themselves for the glory of God we couldn't have done this. Our reputation as a family friendly church is growing in our community and it's all because of you! Thank you for all you did. Thank you for your donations, your investment, and love. You Rock! Don't forget that Daylight Savings Time ends this Sunday! We're FALLING BACK in time once again so, if you set your clocks right you will be rested and refreshed, ready to worship with all your might on Sunday Morning. Also, don't forget that we will have the special monthly Benevolence Offering too! It is the giving season when we celebrate the greatest Gift ever given to mankind - Jesus. In that spirit, we want to provide you with plenty of options to exercise your gratitude towards God and express your generosity. Here are just a few things to put on your Christmas lists. Operation Christmas Child - Check out the OCC table in the fellowship hall for more information on what kind of things to fill a gift box for an underprivileged child who may never have received a Christmas gift before. Wonderland Toy Store - donate new (in the box, with price tag still on) toys valuing between $10-50 to bless families in our community in financial need have the opportunity to purchase those toys at a huge discount at the Wonderland Toy Store. Bring them to the fellowship hall by December 3rd. New Day Stewardship - Check your mailboxes at church for a special flyer and letter regarding our continuing New Day initiatives developed by the Stewardship Committee. Consider how the Lord will lead you to give as you consider your end-of-year giving. There is so much going on at WSBC as the Holidays come close. Please make sure to make the most of these great opportunities. Thank you for all you do! I can't wait to see you Sunday! YOU ARE LOVED!